IHBC Scotland will host a CPD session (from 3.30 to 4.30) at the Listed Property Show in Edinburgh’s Assembly Rooms on 27 October, with free access to the day-long Show for IHBC members who book ahead, while an IHBC stand will offer more informal access and conservation advocacy to delegates, visitors and IHBC members. NB: Booking is essential to secure IHBC places and offers, so book first and fast; places limited and details below. 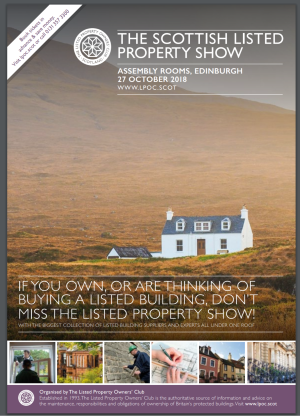 The inaugural Scottish Listed Property Show, organised by The Listed Property Owners’ Club (LPOC), will take place at the Assembly Rooms, Edinburgh on Saturday 27th October 2018. Are you one of the 47,000 listed building owners in Scotland or are you looking to buy? Whether you are conserving, renovating or buying a listed building, the Show will have everything you need. You can meet with the biggest collection of listed building experts and specialist suppliers under one roof. You can find out more in one day than you can through months of personal research! NB: ALL FREE tickets to the show and CPD event for IHBC members MUST be booked in advance. IHBC members can request tickets free of charge by emailing chloe@lpoc.co.uk, confirming they are a member, their full name, email and address and how many tickets they wish. These will be sent out in October. Tickets to The Scottish Listed Property Show are free to the Club’s members and £10 in advance (£15 on the door) to all other visitors. IHBC supporters who are not IHBC members can also claim tickets at discounted rates when they book in advance, and get show tickets for only £8, saving them £7 off the door price. Get your tickets to The Scottish Listed Property Show 2018 for only £8 when booking in advance! Just quote ’IHBC’ when booking tickets online at lpoc.co.ukor when calling 0131 357 3300. Find out more about the Listed Property Show, Olympia London, 9-10 February 2019.